The initial headline that the US and China plan to reconvene talks next week, was all it took to start the stock market bounce. However, added to this was that China lowered the RRR (Reserve Ratio Requirement) by 50bp initially then another 50bp later and that helped Europe to perform. Japan’s Nikkei (-2.25%) hit by commodity price declines and especially industrials (Copper) that were hit Thursday, but saw its lows in early trading and spent the rest of the day recovering. Late US trading sees Nikkei futures +3% at the close. Shanghai and the Hang Seng had already gained over 2% on the trade talks headline, but the RRR news was released after the cash close, so we will wait to see this additional momentum outcome on Monday. The SENSEX (+0.5%) was around unchanged in the final hour of trading but benefited from the China RRR talk into the close. The INR is having another push in late US trade currently +0.5%, but there is lots of speculation ahead of May elections that it could be held around the 70 handle. Europe run better on the Trade Talks and was helped by the China RRR cut announced early in the day. Core indices were already positive and were hopeful of a friendly US employment number to end the first few trading days of the new year. By the end of the European trading session, you could have believed it was Christmas all over again! 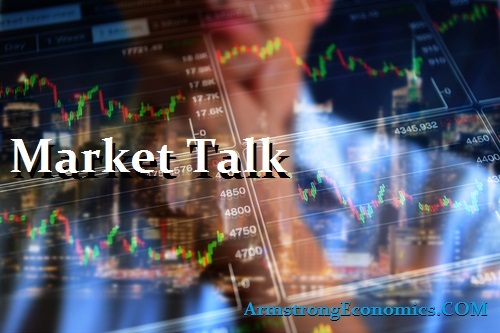 Not only had we heard positive trade talks news, then China eased cash reserves, then US employment data was a great surprise and to top it all we hear from Jerome Powell of sensitivity to market risks! We saw bounces from DAX to Athens with gains registering between +3.5% (FTSE MIB) to +1.4% in Greece. The Bond markets were hit everywhere with yields rising 8bp in Gilts and 4bp amongst the peripheral to 5bp in the 10yr Bund. UK housing sector had disappointing news and hit cable at first, but GBP then bounced in late trading on a Powell comment of patience and sensitivity. US stocks were already positive reacting to scheduled trade talks. Then we saw the RRR news in China and a surprise +315k print on the employment number and futures were off to the races again. Cash Dow opened up +2.5% and after a whipsaw reaction to the FED’s past and present interview, the day was set for the good. J. Powell’s sensitivity and patience remark provided the comfort most were looking for, which resulted in one of the best day trading days in recent history. Some late closing comments from the President Trump interview indicating some optimism ahead of the trade talks has helped maintain today gains and provides positive sentiment for next week. We have closed with a strong 4.3% gain for the Nasdaq and followed closely by 3.35% gains for both Dow and S+P.